When New Brunswick was established in 1784 it was divided into eight counties. As the population grew the original counties were divided and new counties set up; the final complement is 15. These counties are subdivided into civil parishes. 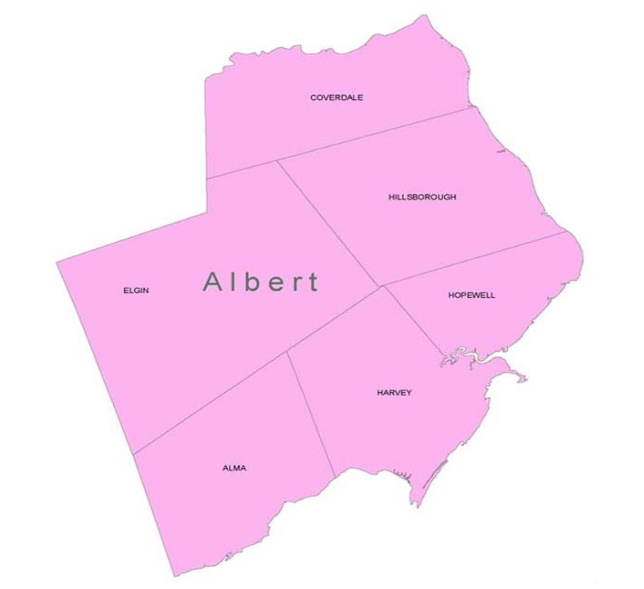 Albert County is located in southeastern New Brunswick, bounded by Saint John and Westmorland Counties and the Bay of Fundy. It was set off from Westmorland County in 1845. Prior to 1845 it consisted of the Westmorland County parishes of Hopewell and Hillsborough, created in 1786; part of the parish of Salisbury, created in 1787; Coverdale, set off from Hillsborough in 1828; and Harvey, set off from Hopewell and a small part of Saint John County in 1838. When Albert County was formed in 1845, Elgin was erected from Salisbury. Alma was set off from Harvey in 1855. Researchers are reminded that much of the pre-1845 genealogical data for Albert County is described in the genealogical guide for Westmorland County.